The day Star Wars: Episode 1 came out. The day Famous Players Colossus opened. This was the day that I can now look back on as the day that started the second stage of my life. I was 23 years old and unemployed for about half a year. I just couldn’t find work and nothing was going my way. Famous Players Cinema was opening new multiplex theaters every year or two, and one was opening soon locally. They had a mass hiring called a “Casting Call” so I waited in a large line with other people who I didn’t know in hopes of getting a job. My interview went ok (later I found out I was in the “maybe” pile) and I was hired two weeks before they opened. Walking into the building a few days before it opened was awe inspiring. The main foyer was four stories tall. The inside theme was of a spaceship, with large alien ticket machines guarding the entrance. Arcade games were on both sides of the lobby, rows of movie posters, banners, cardboard standees, and televisions were everywhere. There was a light show and lasers the could be seen bouncing around the inside of the hallways that lead you to the 18 auditoriums. This was one of the first theaters with a central bar upstairs that overlooked the lobby and an IMAX theater. There was a Pizza Hut, Taco Bell, NY Fries, Starbucks, and a huge concession. It was like a small community hub of fast food chains all brought together to bring more to the movie going experience The slogan for Famous Players at the time was “Big Screen, Big Sound, Big Difference”. 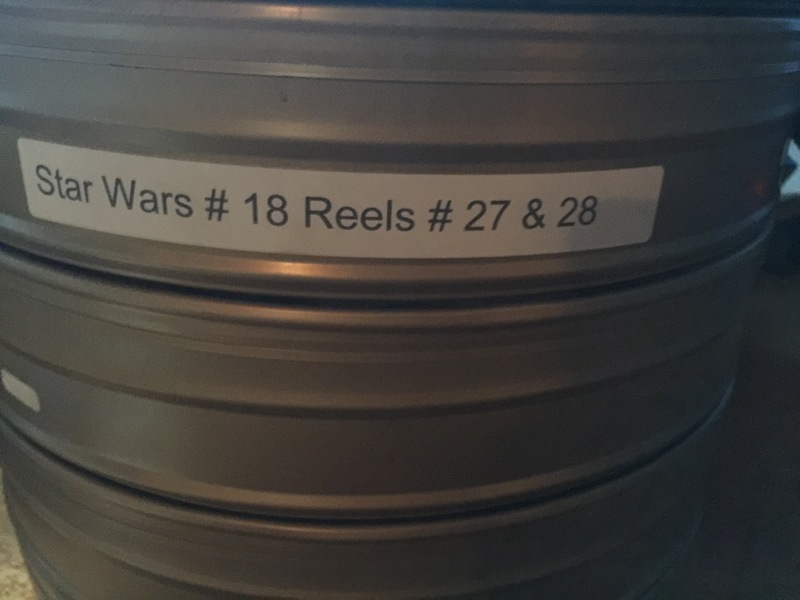 Old film cans from my IMAX days. The general public was finally allowed in on May 19,1999. The opening of Star Wars: The Phantom Menace coincided with the opening of the new theater complex. IT WAS ORGANIZED CHAOS. Crowds of people lined up inside and outside of the mega structure just to see the film. I was lucky enough to have a shift that had me “standing guard” inside one of the auditoriums for the film. I got paid to watch the movie opening night. Pretty cool, even though it was a bad film. Snap shot of some of my memories. Over the next few months, I would make numerous friends. Many of whom I am still in contact with to this day. We would watch screenings or have late nights working followed by hanging out at the Denny’s until the early mornings the next day. But by fall of that year, I hit another low point. My father was getting worse as cancer ravaged his body. I had lost sight of what I wanted in life, so my doctor put me on anti-depressants. I made it through the Christmas season and so did my father. It was the last Christmas I would spend with him. In the start of 2000, Colossus ran a promotion for the staff, followed by an auction. At the auction, I won a private film screening of an older film of my choice. So on my birthday, March 15th, 2000, I ran Ghostbusters for my friends and I, followed by Indiana Jones and the Last Crusade. My mother and father came out to this show as well. Afterwards my father told me he was proud of who I was becoming, the next day I stopped taking my anti-depressants. I don’t believe anyone at the theater knew of my struggle at the time. The safe-for-work photos from some Halloween parties we had. A couple of months later I would meet my wife. I spent the summer having fun with her and my Colossus friends. We were engaged by Halloween of 2000. We would then throw a huge party that year for Halloween. 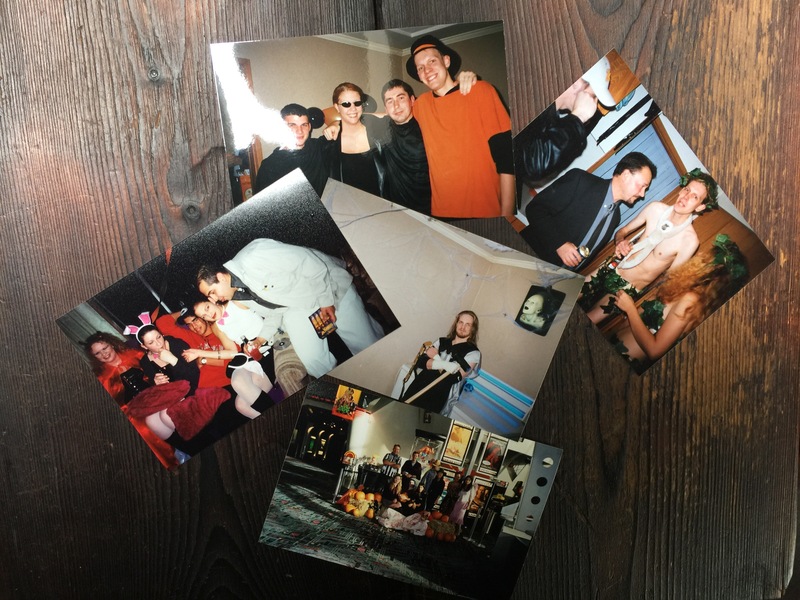 It was so much fun, that for a few years after, we continued to throw pretty amazing parties. The fun ended fairly fast that year. My father passed away one month later and wouldn’t make it to another Christmas. The friends that I had made at Colossus were extremely supportive, in both my joyous times and my lowest times. 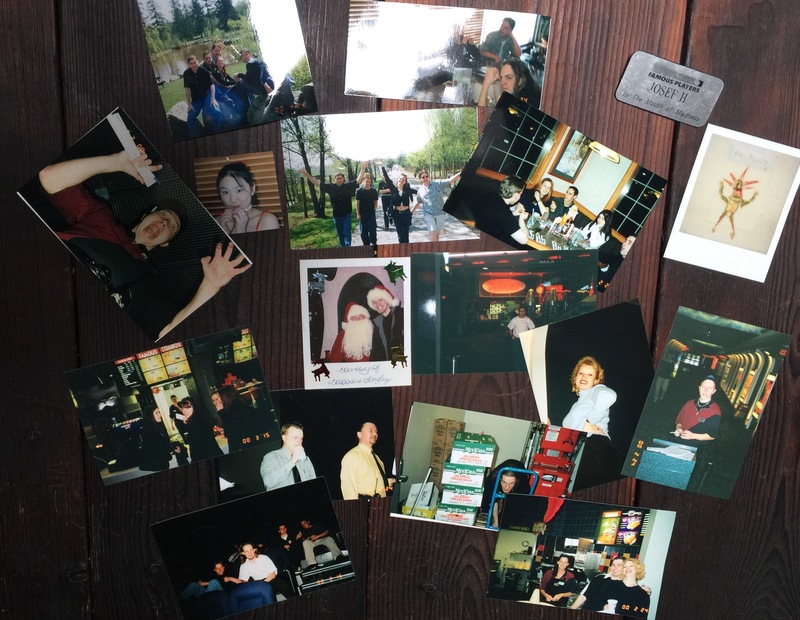 In July of 2001 many of them helped me celebrate my bachelor party and wedding. More parties and more fun continued that summer. A year would pass as I worked to try and make my life better. 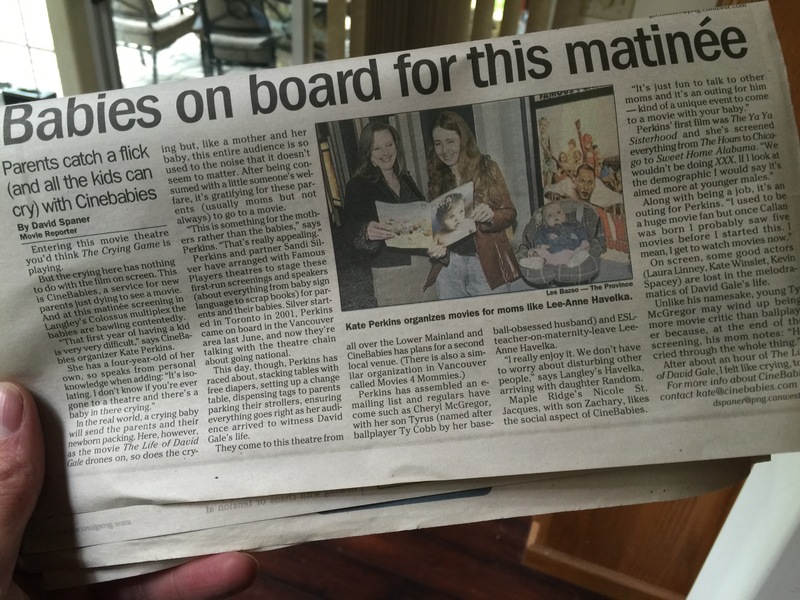 My wife and our first born making the paper. Our first child was born in July 2002 and everyone at Colossus wanted to meet her. She was now a regular attendee to screenings and made the newspaper for a program called “Cinebabies” that allowed parents with small children/babies the opportunity to watch films without being hushed. However, shortly after all of this, I had to leave in order to do more with my life and my growing family. Colossus was a huge turning point in my life. I drive past it everyday and pause once in a while to recall the friends and good times that I made. Many of us have gone on to explore new avenues in our lives, sometimes never to speak again. Others of us have remained close. I have even made friends with people now that I only sort of knew back then. It meant my life was about to change forever.